Multi-layered: Developed for universal 2.5-dimensional grid mapping with support for any number of layers. Efficient map re-positioning: Data storage is implemented as two-dimensional circular buffer. This allows for non-destructive shifting of the map's position (e.g. to follow the robot) without copying data in memory. Based on Eigen: Grid map data is stored as Eigen data types. Users can apply available Eigen algorithms directly to the map data for versatile and efficient data manipulation. Convenience functions: Several helper methods allow for convenient and memory safe cell data access. For example, iterator functions for rectangular, circular, polygonal regions and lines are implemented. ROS interface: Grid maps can be directly converted to and from ROS message types such as PointCloud2, OccupancyGrid, GridCells, and our custom GridMap message. Conversion packages provide compatibility with costmap_2d, PCL, and OctoMap data types. OpenCV interface: Grid maps can be seamlessly converted from and to OpenCV image types to make use of the tools provided by OpenCV. Visualizations: The grid_map_rviz_plugin renders grid maps as 3d surface plots (height maps) in RViz. Additionally, the grid_map_visualization package helps to visualize grid maps as point clouds, occupancy grids, grid cells etc. Filters: The grid_map_filters provides are range of filters to process grid maps as a sequence of filters. Parsing of mathematical expressions allows to flexibly setup powerful computations such as thresholding, normal vectors, smoothening, variance, inpainting, and matrix kernel convolutions. The grid map package has been tested with ROS Indigo, Jade (under Ubuntu 14.04), Kinetic (under Ubuntu 16.04), and Melodic (under Ubuntu 18.04). This is research code, expect that it changes often and any fitness for a particular purpose is disclaimed. An introduction to the grid map library including a tutorial is given in this book chapter. The grid_map_core package depends only on the linear algebra library Eigen. The other packages depend additionally on the ROS standard installation (roscpp, tf, filters, sensor_msgs, nav_msgs, and cv_bridge). Other format specific conversion packages (e.g. grid_map_cv, grid_map_pcl etc.) depend on packages described below in Packages Overview. 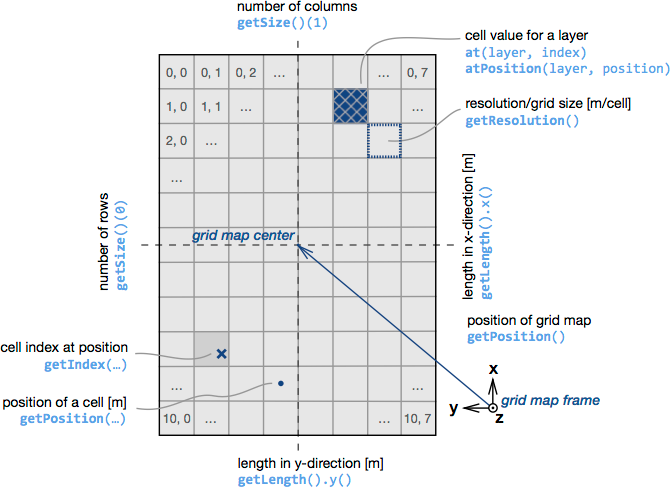 grid_map is the meta-package for the grid map library. grid_map_core implements the algorithms of the grid map library. It provides the GridMap class and several helper classes such as the iterators. This package is implemented without ROS dependencies. grid_map_ros is the main package for ROS dependent projects using the grid map library. It provides the interfaces to convert grid maps from and to several ROS message types. grid_map_demos contains several nodes for demonstration purposes. grid_map_filters builds on the ROS Filters package to process grid maps as a sequence of filters. grid_map_msgs holds the ROS message and service definitions around the [grid_map_msg/GridMap] message type. grid_map_rviz_plugin is an RViz plugin to visualize grid maps as 3d surface plots (height maps). grid_map_visualization contains a node written to convert GridMap messages to other ROS message types for example for visualization in RViz. grid_map_costmap_2d provides conversions of grid maps from costmap_2d map types. grid_map_cv provides conversions of grid maps from and to OpenCV image types. grid_map_octomap provides conversions of grid maps from OctoMap (OctoMap) maps. grid_map_pcl provides conversions of grid maps from Point Cloud Library (PCL) polygon meshes. if you are using catkin tools. The grid_map_demos package contains several demonstration nodes. Use this code to verify your installation of the grid map packages and to get you started with your own usage of the library. For more information about grid map filters, see grid_map_filters. The grid map library contains various iterators for convenience. The other grid map iterators follow the same form. You can find more examples on how to use the different iterators in the iterators_demo node. There are two different methods to change the position of the map: * setPosition(...): Changes the position of the map without changing data stored in the map. This changes the corresponce between the data and the map frame. * move(...): Relocates the grid map such that the corresponce between data and the map frame does not change. Data in the overlapping region before and after the position change remains stored. Data that falls outside of the map at its new position is discarded. Cells that cover previously unknown regions are emptied (set to nan). The data storage is implemented as two-dimensional circular buffer to minimize computational effort. This RViz plugin visualizes a grid map layer as 3d surface plot (height map). A separate layer can be chosen as layer for the color information. This node subscribes to a topic of type grid_map_msgs/GridMap and publishes messages that can be visualized in RViz. The published topics of the visualizer can be fully configure with a YAML parameter file. Any number of visualizations with different parameters can be added. An example is here for the configuration file of the tutorial_demo. 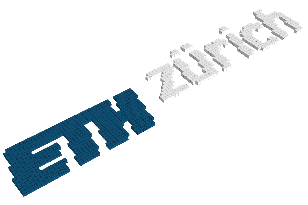 The name of the grid map topic to be visualized. See below for the description of the visualizers. The grid map to visualize. Shows the grid map as a point cloud. Select which layer to transform as points with the layer parameter. Shows the grid map as a "flat" point cloud, i.e. with all points at the same height z. This is convenient to visualize 2d maps or images (or even video streams) in RViz with help of its Color Transformer. 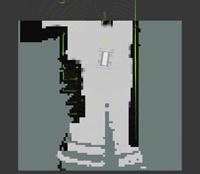 The parameter height determines the desired z-position of the flat point cloud. Note: In order to omit points in the flat point cloud from empty/invalid cells, specify the layers which should be checked for validity with setBasicLayers(...). Visualizes vector data of the grid map as visual markers. Specify the layers which hold the x-, y-, and z-components of the vectors with the layer_prefix parameter. The parameter position_layer defines the layer to be used as start point of the vectors. Visualizes a layer of the grid map as occupancy grid. Specify the layer to be visualized with the layer parameter, and the upper and lower bound with data_min and data_max. Visualizes a layer of the grid map as grid cells. Specify the layer to be visualized with the layer parameter, and the upper and lower bounds with lower_threshold and upper_threshold. Shows the boundary of the grid map. Note: Color values are in RGB form as concatenated integers (for each channel value 0-255). The values can be generated like this as an example for the color green (red: 0, green: 255, blue: 0). The grid_map_filters package containts several filters which can be applied a grid map to perform computations on the data in the layers. The grid map filters are based on ROS Filters, which means that a chain of filters can be configured as a YAML file. Furthermore, additional filters can be written and made available through the ROS plugin mechanism, such as the InpaintFilter from the grid_map_cv package. Set values below/above a threshold to a specified value. Compute for each cell of a layer the mean value inside a radius. radius: 0.06 # in m.
Compute the normal vectors of a layer in a map. Compute a new color layer based on normal vectors layers. Parse and evaluate a mathematical matrix expression with layers of a grid map. See EigenLab for the documentation of the expressions. # expression: abs(elevation - elevation_smooth) # Surface roughness. # expression: 0.5 * (1.0 - (slope / 0.6)) + 0.5 * (1.0 - (roughness / 0.1)) # Weighted and normalized sum. Parse and evaluate a mathematical matrix expression within a sliding window on a layer of a grid map. See EigenLab for the documentation of the expressions. Duplicate a layer of a grid map. Delete layers from a grid map. layers: [color, score] # List of layers. Use OpenCV to inpaint/fill holes in a layer.